I think I’ve mentioned before that, when I was a kid (read: teenager, and not ashamed to admit it!) I was a huge fan of the Disney cartoon, “Pepper Ann.” One of the continual running gags in the later seasons was “the night of tacos” and taco references in general. So of course, that’s what pops into my head whenever I eat tacos. It was my mom’s idea to have our own taco night recently. Normally, I cook whatever sounds good when I’m planning dinner in the morning, but every once and a while Mom chimes in with something she’s been craving. This time, tacos were it, and it just so happens that The 30-Minute Vegan has a great recipe for a do-it-yourself vegan taco night. A little tempeh cooked with a few authentic taco spices, some refried beans, and a bunch of fresh veggie toppings, and all of a sudden you’ve got fantastic tacos! This is a great go-to meal when you’re in a hurry or if you need to feed a bunch of people all at once. Everything can be set out in separate bowls or on plates so people can help themselves and build their own ultimate vegan taco. 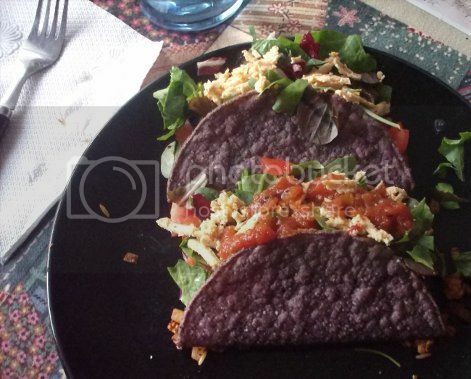 As you can see, I went with blue corn taco shells one, because we adore blue corn tortilla things here in the QV household and two, because they were cheaper for some reason. Good organic taco shells, I’ve learned, are on the expensive side, which is probably why I don’t make hard-shell tacos very often! It’s too bad, really, because these were very good. I don’t think I’ve made them before; if I did, it was a long time ago. But I’d love to make them again, hard shell or not. The flavor of the seasoned tempeh was very much like what I remember of omni tacos, minus all that is gross about ground beef. For the refried beans, I cheated and used a can of Bearito’s brand with green chiles. 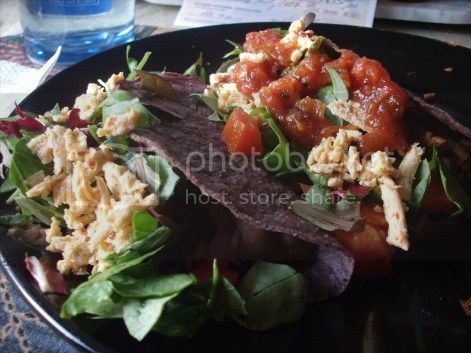 Then Mom and I went to town with onions, chopped tomatoes, shredded mixed greens, Daiya pepperjack shreds, and salsa. There may also have been chopped bell peppers. Recipe: Vegan Roasted Vegetable & Chipotle Tempeh Chili — With Kohlrabi!